TRAVEL: Take a Seadog Cruise in Chicago | A Savings WOW! Are you looking for something fun to do in Chicago either as a staycation or a vacation? Check out Seadog cruises. You’ll see Chicago’s scenic lakefront while being entertained. Enjoy front-row seats to the spectacular fireworks display aboard their Lakefront Fireworks Cruise! Cruise along Lake Michigan with an exciting speedboat ride paired with an informative tour of the Chicago skyline, then end the evening with a dazzling fireworks show and top-40 hits playing in the background! The open aired vessel allows for panoramic views, providing a perfect view. 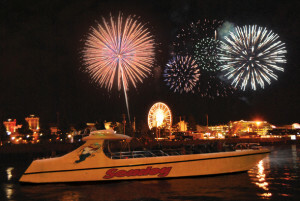 The Seadog Fireworks Cruise is available on Wednesdays and Saturdays, running from Memorial Day through Labor Day. They also offer customizable group events for up to 450 people. You can also check out their specific holiday cruises, such as Memorial Day, the 4th of July, and Halloween. Do you have a dog? You are welcome to take your dog along on the cruise and they ride for free, space permitting! We’re excited to be taking one of the fireworks cruises later this month. We’ll let you know how our experience is and we’d love it if you would share your experiences, too! Visit Seadog’s website, their Facebook page, follow them on Twitter, or give them a call at (888) 636-7737. Disclosure: We will be attending a Fireworks cruise in exchange for this post. However, all opinions are our own honest opinions. Please see our disclosure policy for more information. Wow! This sounds like a lot of fun! I cannot wait to try it when we visit Chicago! I went on this cruise courtesy of Madame Deals!! loved the fireworks!